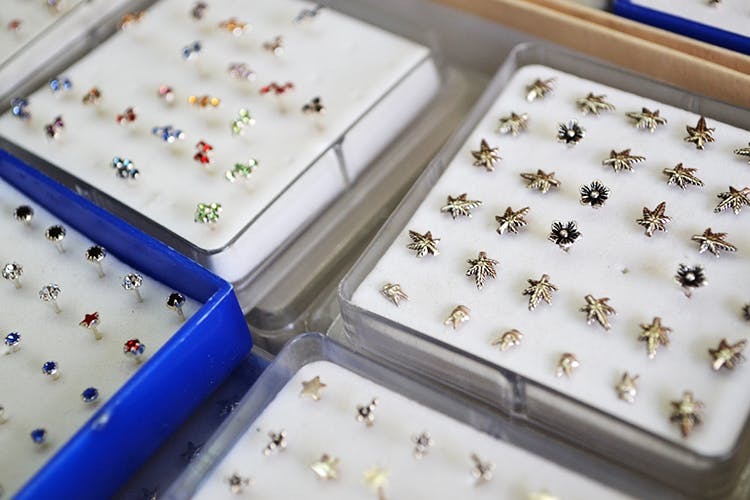 B Raju Achary's silver store in Jewellers Street in Commercial Street is home to cute and quirky nose pins (and rings) in the form of animals like turtles and dolphins, flowers, leaves, and abstract designs. Prices for these start at an easy INR 50. When it comes to accessories, B Raju Achary is a guy who knows his job and what his customers want exactly. Hit him up for quirky silver nose pins for all your accessory goals and these come at a steal. And in every imaginable shape including tiny elephants, dolphins, turtles, petals, leaves, and stars. Apart from nose pins, you can also find nose rings in blue, red, green, and yellow as well as in oxidised designs. Studs with stones are available for both men and women, and guys with piercings, you can pick up studs, rings and pins in cool designs like scorpions, bikes, and skulls. The shop might be a little hard to find, so you definitely need to walk around a bit to find this place. Your marker is the Bombay Dyeing shop on the main road of Commercial Street. Once you are there, take the lane bang opposite it that leads you to the silver shop lane. A minute’s walk and you’ll come to a crossroad with Raju Achary’s shop on the left. The shop’s tiny, so you might have to wait your turn to see the collection if it’s crowded. We found that the best time to avoid the crowd and shop peacefully is on Tuesday and Wednesday evenings. Sunday’s are a big no-no, especially in the evening.